Though the Terrasaurs have shown a remarkable willingness to fight alongside Earth’s other defenders, some are trickier to work with than others. 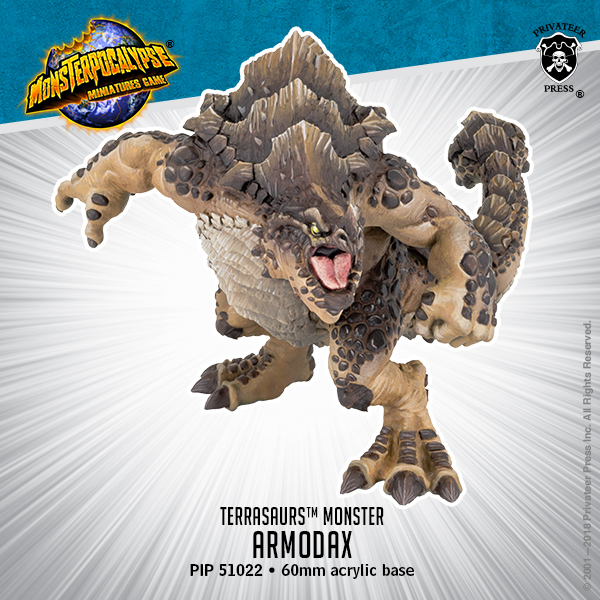 Armodax is a hulking monster covered in armored plates and boasting a weighty clubbed tail that serves better than any wrecking ball at toppling buildings. He has demonstrated unrestrained delight in annihilating skyscrapers, factories, and power plants while clashing with Earth’s foes. Yet there is no question he is worth preserving, given his unstoppable ferocity. His allies have learned to ensure the complete evacuation of any zone he has entered.